Weddings for most are typically a one-different cultures, parental relationships and of course the different traditions within different areas of the globe. We feel that what it is as a photographic DUO that truly sets us apart from the rest and provides us with an advantage into our clients coverage is not only the importance that we place on having a relationship with out clients but the power of insight which we have gained throughout our own culturally blended experience as a couple/family, equally being able to relate to our clients and their families wants and needs to truly know and understand the meaning and purpose behind all aspects of the process whether an engagement ceremony & reception or the start of your actual wedding celebrations. Our wedding gallery will allow you as a prospective client to gain a better understanding of what you can expect from your wedding day captures as you scroll through some of our most recent and relevant work that we have done over the years. Should you find that it compels you feel free to drop us a line or place a ring as we would love to hear from you. Will you go to multiple locations? We will shoot at multiple locations as needed, we can also advise clients on time that will be needed to do so. Often enough many clients do not remember to take into consideration travel time, traffic, parking and walking to certain locations, feel free to ask us as we have a bit of immeasurable experience and insight into the nature of these considerations. Depending on coverage end and start times we may require accommodations. If we are covering an event until 12am and coverage starts at 6am once more we would require accommodations in order to provide our clients with the best coverage possible, understandably. If travel is more than 300 miles airfare may be required, please ask in order to determine the requirement. Have you worked at my venue? While it is impossible to have worked at everyone venue we have worked at quite a few! If this is a concern please do ask. Also keep in mind even if we have not covered an event at your venue we do offer site visits as well as want to remind you that sometimes a new and fresh perspective can yield images at your venue that you did not realize were possible. Are you available for my wedding date(s)? We do not keep an online calendar online to check availability, but a quick email can certainly address this question, text even (703.314.7861) as we are super responsive and pride ourselves on never leaving any question unanswered. Have you photographed a North Indian or South Indian wedding before? We have photographed that and beyond! We are familiar with all things either or. While most of our weddings appear to be North Indian, we are comfortable photographing both. We always carry back-up equipment in our vehicles as we can never be sure if we will need it or not for any reason. We also provide our event(s) with additional lighting as and when needed. Can you provide a Certificate of Insurance (a.k.a: COI) to my venue coordinator? We are fully insured and can directly work with your venue coordinator to ensure we issue a COI with the correct verbiage and coverage as needed in order to be compliant with your venue. What is the ideal space for getting ready? Obviously the bigger the getting ready space the better. Allowing us to step back and document the getting ready without climbing all over everyone or interferring with your make-up, hair andpossibly stylists efforts in getting you ready can be everything when looking back on yourimages and the perspective in which it allows us to capture your getting ready photos. Natural light when getting ready is essential to creating those crazy light and airly images that are all the instagram craze these days, allowing us to really keep that third dimension to your images without trying to recreate it through artificial lighting tenchniques with on or off camera flash. We knowand understand that some of our clients are not given the luxury of natural light images during their getting ready images and we will do our best to set the correct expectations and create unique images that are not "all" dark and moody but certainly encapsulate your day as it was. It is good to plan and take note before your hair and make-up team arrive that they place you in a position where your photo and video team can work around them without interferring in their time with you, but also keep you positioned in a way that the window/natural light streams in on your face without harsh light/streaking falling on your face. Fall off window light is ideal for great softly lit imagery, this is why as photographers we desire overcast-cloudy days, they are ideal for portraits. Is there anything I can do to ensure I get all those detail shots I love on your site? HERS: dress, evening dress (if second look is taking place) shoes, rings, bracelets, necklaces, earrings, bangles, arm and waist bands, heirloom jewelry, handkercheif, or tokens; like something borrowed, blue, old or new items and of course your wedding invitation should you want us to arrange and style that too. HIS: wedding attire, reception attire, shoes, belt, socks, watch, rings, bangle, bracelet, handkerchief, pocket square, turban, shawl, swords, pendants, pins; tokens like cufflinks, horoscope rings, custom grooming items, and that invitation too! BRIDES: Why be stuck with the standard unavoidable shots of your dress sprawled over the bed or hung in front of a washed out window? Or the hangers that are customized yet can't hold the weight of your dress? The perk to these mannequin's is that when set up the night before it allows for easy hand steaming and the wrinkles to naturally fall out of your dress! Use our associate link here to ensure you get the right one, https://amzn.to/2OdfBLm - keep in mind they are sold by waist and bust sizes, this is sure to make your detail shots stand out from the rest! We would like to take couples photos, where should we take them? If we have shot at your venue previously we can give options to where the best locations are based on the time of day in which your couples photos will be taking place. We understand clients have favorite areas around the venue they have chosen for their wedding day and we will do our best given the time allocated to make sure we captured all the wonderful things that attracted you to the venue given the time allocated. We want our clients to be confident when hiring us that we will guide them into getting the best, most creative and properly lit shots on their wedding day. So understanding that the fountain in the front of the hotel is gorgeous at high noon may not be the ideal spot to take all of your couples photos we can definitely try to snag a few unique ones there for sure. If your venue is new to us as photographers we can arrange to do a walkthru with you or plan to arrive earlier on the day of to ensure that we have scouted and choose the best location to take photos as a couple on your wedding day. What is the "first look" exactly and how does it happen? The "first look" is essentially meant to be when the bride and grrom see each other for the first time before the ceremony. Lots of clients are electing to do this in order to not take away that moment of being seen for the first time and have that private beginning with each other as the start of their wedding. The trend mostly put into place by clients really wanting to finish off combined bridal party, couples and family portraits before the wedding ceremony takes place in order to make the most of their portrait time. The "first look" typically is set-up. This simple means a location is most often predetermined and the clients are given instructions as to where each will come from and the act of first seeing each other is placed into motion - all of which is captured as it takes place in a candid manner. Do you recommend a first look? We do, but do not require it. First looks can often ease a bit of the pressure when trying to squeeze so many things into the wedding day, add to it the South Asian element and the already tight schedules - first looks are certainly a sure fire way to get a little alone time before chaos let's loose - we say that in the most endearing ways as we truly love the hustle and bustle of our all of our clients wedding celebrations! “First Looks” are almost a standard nowadays and but we certainly don’t want to add that stress to anyone's big day. We also respect that some clients are superstitious and some traditional so whichever route you choose to take with your timeline is alright by the Regeti's! There are PROS and CONS to everything, as with “First Looks” they simply tend to give us more time with our clients than we would normally get as time is very limited post ceremony with most clients often moving into a second look. The first CON to note is that it will require you to wake-up and begin hair and make-up a bit earlier. This could cause all things to shift forward to backwards a little depending on family traditions whether group prayer or pooja's that are required before leaving the room to start portraits. Our "first looks" tend to start and move into individual and bride & groom portraits and while idealistically we would love an hour to do all this most clients only have about 30 minutes to give on the wedding day. We would be more than happy to discuss this with you in more detail if you are undecided. After all, that is what we are here for! Can my friends and family be there for our first look? Certainly, Although most often this is a quiet more private moment between the couple there are times that we have clients that would like to have their bridal party and immediate family witness this. We just ask that you remember that we will be moving into couples and individual portraits and prefer that time alone with our clients. Most often there are friends that want to come to help out - but unfortunately this can often make clients nervous, self concious, reserved a little and can cause a delay as toomuch primping can occur in an effort to make the bride feel pampered. I promise none of that will be overlooked as we shoot all our couples portraits together and our attention to detail is pretty on point! Do you recommend doing family photos before the ceremony? We do recommend immediate family photos before the ceremony if clients intend to have a “First Look”, when and if time permits. Most times with turmeric dusted rice, confetti and sindoor powder clients opt. to have their portraits, couples photos and immediate family portraits executed before the ceremony takes place. How long should I allocate for family photos before the ceremony? We tell clients that a good rule of thumb for determining howmuch time to allocate for formal photographs is 2 minutes per photo. We find that often enough even though formals can move rather quickly there is typically a cousin, auntie, uncle, sibling or parent that will "get away" and we will need the additional buffer time to locate and execute the portrait. Whether they are trying to attend to guests, children, parents or assist in wedding responsiblities it happens and we want to be sure our clients are not stressed out by the time constraints that are present at every event we photograph. Part of having a worry-free wedding day is ensuring that we set realistic, reasonable and practical timelines. The first thing cut back on when timelines are not practical or schedules begin to run behind is time for photos, unfortunate when that takes place safe shots take precedence over the artistic and create ones and the variety of your images will suffer. Therefore we want to makesure all our clients get the most out of their wedding day and their time with us as their creative minds. On average our smaller American non-denominational ceremonies allocate 15 minutes for family photos while our larger South Asian Indian clients allocate 30 minutes for their photos when wanting to take immediate family photos prior to the start of their wedding ceremony. We would like to take photos with family post wedding ceremony, how much time do you need? This truly depends on how many formal photos you will be having taken. We highly recommend creating what we refer to in our industry as a "shot list", this is not a list of images you would like to have on your wedding day rather a list of the different combinations of family photographs you would like to have take with families, friends, or even officiants, priests, pundits, rabbi's or pastors. It's a structured list that we ask families to work together on so thatthey can reasonably agree to formal photos that they would like to see when looking through their proofs post wedding. Often enough because we tend to recoomend clients have immediate family photos taken (outdoors when possible) prior to the start of their ceremony, when they are their freshest, they still often want images in front of the "altar" or "mandap" when services have taken place in a church or ballroom. 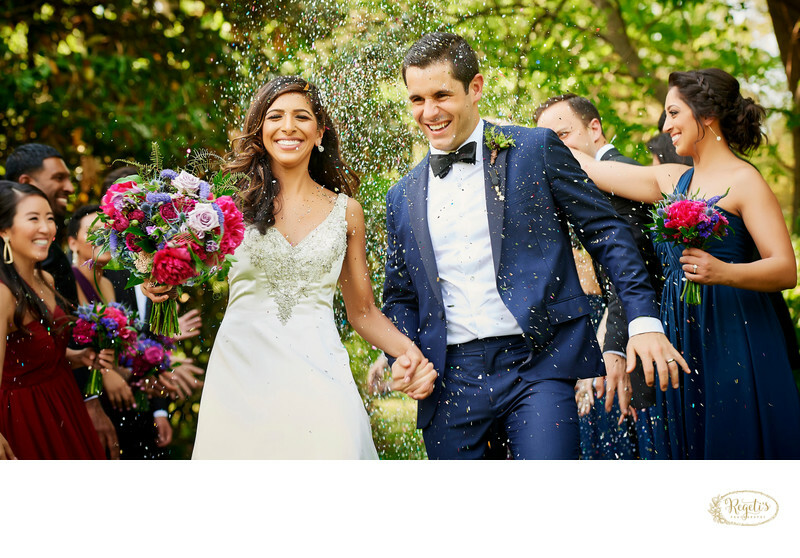 For this we often tell clients to create all the different combinations for the preceremony photos and cut it down to 3-5post wedding meaning; one of the bride's side, one of the groom's side and one of the one of the two as unified. If parents are divorced we recommend doing a photo of each set of families and two separate extended portraits to meet all needs within the extended family. Understanding that if you have 15 combinations portraits will take 30 minutes and if you have 30 we will require an hour to execute the shot list provided. On average our smaller American non-denominational ceremonies allocate 30 minutes for family photos while our larger South Asian Indian clients allocate 1 hour for their photos when wanting to take immediate family photos post wedding ceremony. When should I tell my bridal party to be ready for photos? Keep in mind the logistics that go into coordinating everyone getting ready. When to tell the bridal party to be ready depends on a number of factors, but first and foremost how you plan to incorporate them into your wedding day. Some clients have bridal parties full of friends, others full of family, others friends and family, and some strictly cousins or out of town guests with other family commitments prior to the ceremony that make it tougher for them to play larger roles in the bride's getting ready. If you are wanting the bridesmaid to be in your gettingdressed photos we recommend having them dressed and ready by the time you complete your hair and makeup. Especially Mom, it is important that if Mom is still with us that she take part in your getting dressed. These can often create some pretty great captures as the day is so busy and things are moving so quickly that even Mom hasn't had a moment to take in the realization that her daughter is getting married today! We refer to these moments as time to breathe, enjoy them take them in, because we can promise you are gonna miss these when they are gone, we can't wait to grab them all and freeze them in time. If you don't mind bridal party members not being with you while you get ready then afford them the time to get ready at a slower pace on their own and join you post first look and couples photos. This can relieve some stress and allow additonal time for your hair and makeup team to put the finishing touches on making your girls look immaculate! FOR THE GUYS: You want them to be with you getting ready, especially Dad if he is still with us and your best man if you are able to single one out! These create some great helping hands and add depth to the story telling of your images. Do I need to hire lighting and AV for my event? This is highly recommended in order to provide you with the best photography possible using the most flattering of light. You want to remember that event lighting is a talent and skill that requires an understanding of light placement and good shadows and bad shadows, we can work closely with your lighting an AV team to ensure that the end result is always the best result. Please don’t hesitate to let us know if assistance/guidance is needed. Can you recommend vendors such as; catering, florists, decorations, mehndi artists, hair stylists, make-up artists or a venue for my event(s)? WE CAN AND LOVE TO! Photography is often enough the 2nd or 3rd in line of booked event professionals. Photographers have the most engagement with all of your actually vendors coming in a close tie with your event planner/coordinator if you should choose to hire one (*we’ve got recommendations for those too! ), so asking your photographer can provide you with an array of options you may have yet to start to explore. When can I expect to see my event images? Our images are provided online within 6-8 weeks post wedding day. Once you confirm your preferred shipping address we will then ship your wedding images directly to your on a beautifully branded thumb-drive. What is the difference between FAVORITES and the proofs in my gallery? Every photographer will vary on how they offer and deliver their images. For us we deliver all of your images within an online gallery as your proofs to view quickly and in an organized manner. These images are LOW resolution and saved specifically optimized for web viewing only and not for printing. Print files are much larger and are provided either immediately via Google Drive access or will arrive on the provided thumb-drive that we will ship immediately upon receiving your address confirmation. Within your online gallery is a FAVORITES folder and this is the folder that if you looked at nothing else would recap the highlights photographically of your celebration(s) these are retouched personally within photoshop and remove any non-permanent personal imperfections that may distract from the beauty of that particular image. Can I order prints and products? Through our online cart system you are able to order prints and products that we are currently offering. Print orders placed are shipped within 5-7 business days. Depending on the product time frames will vary. Files are shipped within 6 to 8 weeks post wedding day. Albums are shipping within 6-8 weeks post approval. Prints are shipped within 5-7 business days of your order being placed. Wall Art is shipped within 4 weeks of placing your order and retouching requested are emailed within 5 business days. All shipping dates are subject to change and fluctuate based on the time of year and influx of orders that may be received at any particular time. Will we receive all our images? Yes. You will receive all the images we take from beginning to end. We do not edit our images to cut down to a number rather to provide you with quality over quantity. We will remove blinks, wardrobe malfunctions, lighting test shots and any patched panoramic stitches we make take once stitched. On average with two photographers, clients can expect to receive around 100 images for every hour of photographic coverage provided. All of our delivered images are color corrected. All images within the FAVORITES section of our gallery and on our website are retouched. All images printed and within your album(s) are always retouched. We do not overly soften or retouch our images as we intend for them to remain as true as possible to capture. Blemishes, fine lines, wrinkles, rashes and irritations are non-permanent issues that we address, however if you wish to have a mole removed, additional softening or a family member disappear/cropped please feel free to email us those special requests and we can advise you on if it is possible or not. We are here to help in any way we can. Stylistically images cannot be fixed/edited so it is important that esthetically you love the look and feel of our imagery before you hire us to photograph your wedding day. The perfect match is extremely important when it comes to hiring your photographer. Yes. All of our clients received their images in the highest of resolution with shared copyrights. Will my images be watermarked or have logos per se? No. The only images marked are images that we use within our own social media platforms. Can I order additional thumbdrives/hard drives for our parents? Certainly. Please send your request and we can provide you with a link to pay for additional items online. Can I order an additional cinema video play book? How do I begin the album process? Our cart system is designed to make this as easy as possible and once your images are online you receive an email that gives you line for line exactly what these steps and the process is to move forward in having your albums designed and ordered. How soon would I receive my wedding album? Wedding albums are shipped within 6-8 weeks post approval you will received a UPS tracking email sent directly to your inbox once shipping takes place. What if your should become ill and not be able to cover my event(s)? Through Associates that work alongside of us on a regular basis and a network of amazing photographers we have built relationships over the years with you would be provided coverage for your event(s). In the event that there was time we would provide a refund if preferred to allow you the opportunity to find your own preferred replacement as well. The booking process is quite simple. Once you have shared your details you will receive a proposal for services based on your needs & wants. Once reviewed and accepted you will receive a contract for services to be returned with your non-refundable deposit. This holds the date on our calendar and ensures that Regeti’s Photography is booked exclusively for your events. Will you hold my date(s)? Unfortunately because we only take 20-25 events per year we cannot hold any date(s) for clients without a formal signed contract and deposit for services. What if our wedding is canceled? Will you offer a refund? In the event that your wedding or celebration(s) are canceled we would not provide a refund for services. However, we will allow for the balance to be transferred towards another family member, friend or used towards others services. These situations are done on a case by case basis and determined at that time.